The Ostroy Report: "I'm Paul Revere, and You Know Nothing of My Work!" "I'm Paul Revere, and You Know Nothing of My Work!" Man: "Oh, really? Well, it just so happens I teach a class at Columbia called "TV, Media and Culture." So I think my insights into Mr. McLuhan, well, have a great deal of validity! Well, if only we could present Paul Revere to Tea Party queen Sarah Palin he'd surely echo McLuhan in telling her she knows nothing of his work. And, he'd probably be standing with the Statue of Liberty because she apparently knows nothing about either of them, or of most of our nation's history for that matter. Up in Boston last Thursday The Wasilla Wonder was asked about Paul Revere’s famed ride and she said he "warned the British that they weren’t going to be taking away our arms. By ringing those bells and making sure as he’s riding his horse through town to send those warning shots and bells that we were going to be secure and we were going to be free." "You know what? I didn’t mess up about Paul Revere. "Part of his ride was to warn the British that we’re already there. That, hey, you’re not going to succeed. You’re not going to take American arms....Here is what Paul Revere did. He warned the Americans that the British were coming . . . and they were going to try take our arms and we got to make sure that we were protecting ourselves and shoring up all of ammunitions and our firearms so that they couldn’t take it,’’ Palin said yesterday. But remember that the British had already been there, many soldiers for seven years in that area. And part of Paul Revere’s ride — and it wasn’t just one ride — he was a courier, he was a messenger. Part of his ride was to warn the British that we’re already there. . . . You are not going to beat our own well-armed persons, individual, private militia that we have. He did warn the British." As my grandmother used to say, oy vey! Too bad the Fox-friendly Wallace let her off the hook too easily and didn't press her on the facts. Had she been on a real network, not the GOP Softball Channel, she would've earned the public embarrassment and humiliation she so rightly deserved. Will someone please get this poor woman a history book?! Just a week earlier she gave a convoluted explanation of the Statue of Liberty's origin and significance. I'm not sure who's more ignorant of American history, Palin or her Tea Party nemesis Rep. Michelle Bachmann, who a few months ago claimed the "Shot heard round the world" was in New Hampshire, not Massachusetts. What is with these Tea Baggers? Is being dumb a requirement? To set the record straight for Grizzly Mama, here's what PaulRevereHouse.org has to say about the historic ride: "On the evening of April 18, 1775, Paul Revere was sent... to ride to Lexington, Massachusetts, to warn Samuel Adams and John Hancock that British troops were marching to arrest them... On the way to Lexington, Revere "alarmed" the country-side, stopping at each house, and arrived in Lexington about midnight. As he approached the house where Adams and Hancock were staying, a sentry asked that he not make so much noise. "Noise!" cried Revere, "You'll have noise enough before long. The regulars are coming out!" After delivering his message, Revere was joined by a second rider, William Dawes, who had been sent on the same errand by a different route. Deciding on their own to continue on to Concord, Massachusetts, where weapons and supplies were hidden, Revere and Dawes were joined by a third rider, Dr. Samuel Prescott. Soon after, all three were arrested by a British patrol." 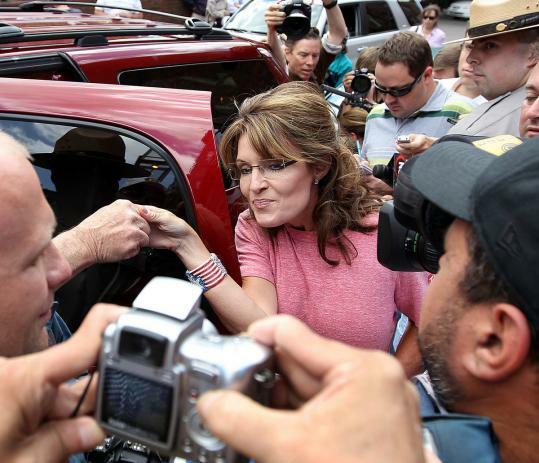 So what's next for Palin as she glides her giant PalinMobile-of-Truthiness across America? Perhaps she's preparing for her next speech entitled The Gettysburg Address: Gen. Robert E. Lee's Finest Virginia Speech. Anything Palin says or does deserves any attention from anyone because of why? Because of people like Russ Feingold, Dennis Kucinich and Bernie Sanders. They are the true dangers to Amerika. So don't talk about them, talk about Palin instead. All this "hoop-la" over Paul Revere. Granted, Palin is so stupid she couldn't pour water out of a rubber boot with the instructions on the heel, but Paul Revere only rode 19 miles. Isreal Bissel did the serious riding/warning. If it wasn't for H.W. Longfellow and that poem of his, we would have never heard of Paul Revere. And yes, I believe it IS a requirement to be willfully ignorant and ego-centric to be a Teabagger. Why would you be otherwise? enough about palin, she is empty headed. any comments on weiner or do you live with blinders on.